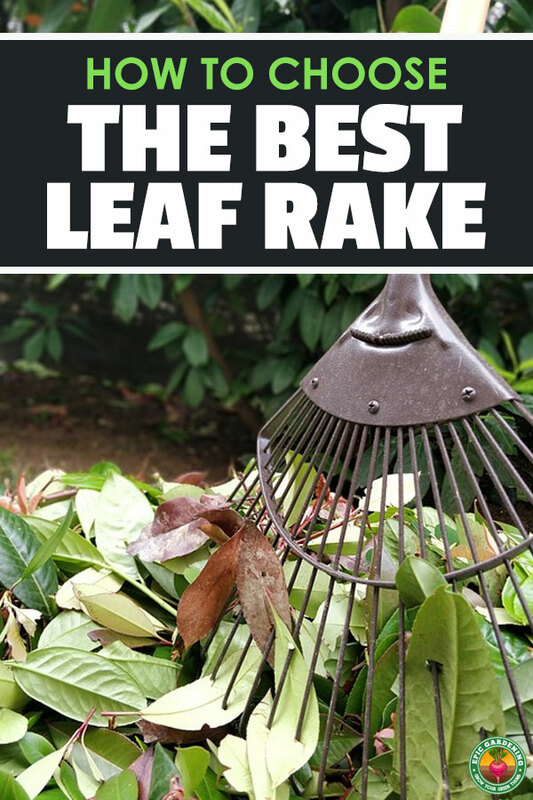 1 Why Is a Good Leaf Rake Important to You? 6 So, Which Is the Best Rake? If you’re like me, you’ve spent hours upon hours raking your yard. Raking leaves is a combination of proper technique and the right equipment…and for a while, I didn’t have the right equipment. This article explores what you need to know about raking leaves: the proper leaf raking techniques along with the best types of leaf and garden rakes. *These garden rakes (and more) are covered in more detail below. 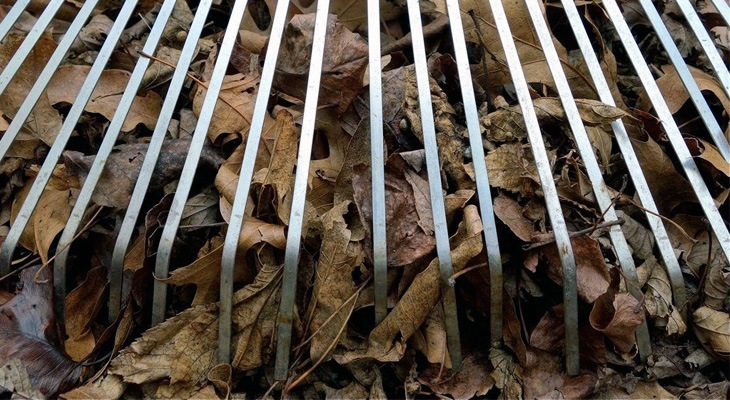 Why Is a Good Leaf Rake Important to You? Your effectiveness raking leaves depends on the type of rake you use and the amount of space you need to rake in your yard. If you have a large lawn or dozens of deciduous trees, a more expensive leaf blower may be a better investment because you don’t put so much effort into moving tons of leaves from one area to another. But if you care for a small lawn with only a few trees, nothing takes the place of a little exercise in the fresh air with a quality rake in your hands. Let’s look at some of the choices for types of rakes. In my search for the perfect lawn rake, I’ve tried plastic, bamboo, and metal rakes, and found most of them lacking in the qualities needed for a good raking session. Here are the upsides and downsides of each type of rake to consider before you make your final decision. For what it’s worth, I don’t recommend anything besides metal rakes – and trust me, I’ve tried them all. The rake head is 20-24” wide. Any larger and the rake is unwieldy. Any smaller and it takes forever to rake your lawn. The tines are closely spaced. The tines are slightly curved or straight at the ends, not curved at a 90° angle like a garden rake. The tines need to be thicker to support the strain you put on them. The handle is made of wood or metal and may have a cushiony foam grip. The rake head is solidly attached to the handle, not just stapled in place. The best way to rake leaves is to pretend like you’re sweeping the floor. Use both hands to hold the rake and switch hand positions regularly to relieve pressure on one side of your body. Keep your knees slightly bent. Bend slightly at the hips, but don’t reach too far forward with your rake because excessive bending over time strains your back. Leaf rakes work best when you slowly walk backward while using the rake to pull the leaves toward you. 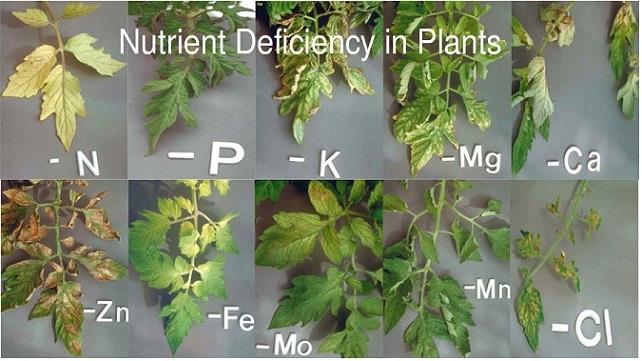 You have options for dealing with your leaves. First, you can lay a tarp down on the lawn and rake your leaves onto the tarp. 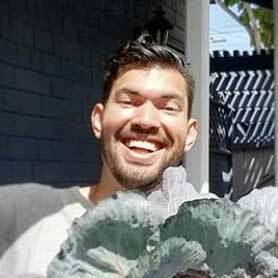 When the tarp is mostly full, collect the corners of it in your hands and drag it over to your main leaf pile or compost area and dump the tarp. 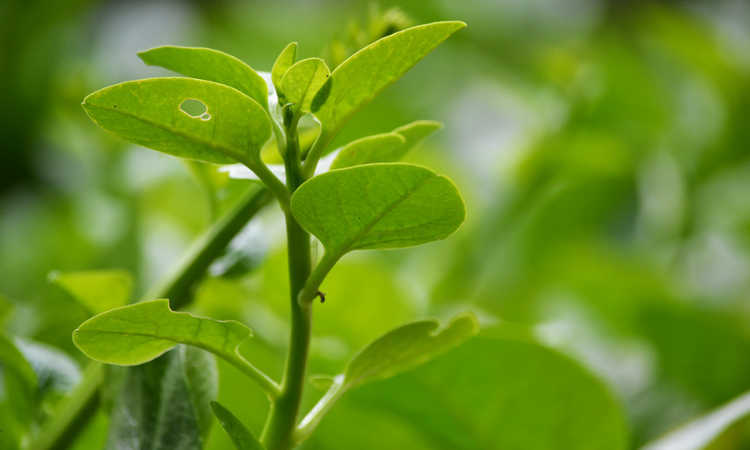 Another option is to collect the leaves into smaller piles and then transfer the piles to a wheelbarrow or clean plastic garbage can and move the leaves to your main pile. Finally, you can collect your leaves in plastic garbage bags, which is a good idea if your city collects yard refuse. Although you can rake your leaves a bit at a time as they fall, I prefer to wait until all the leaves are down, thereby saving time by handling them all at once. The best time to rake leaves is on a calm day when the leaves are dry and easier to move around. Wear a pair of heavy duty leather or canvas gloves to protect your hands from dirt and blisters. 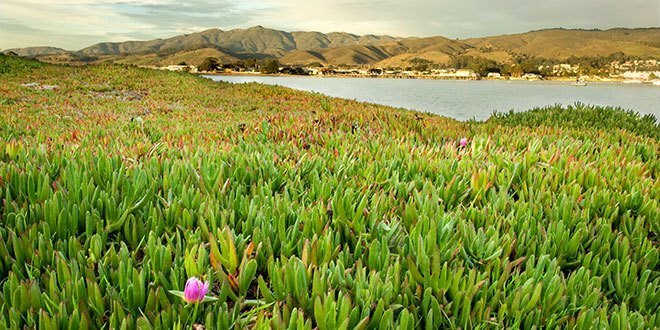 Cover your arms and legs with a long-sleeved shirt and a pair of jeans for protection. 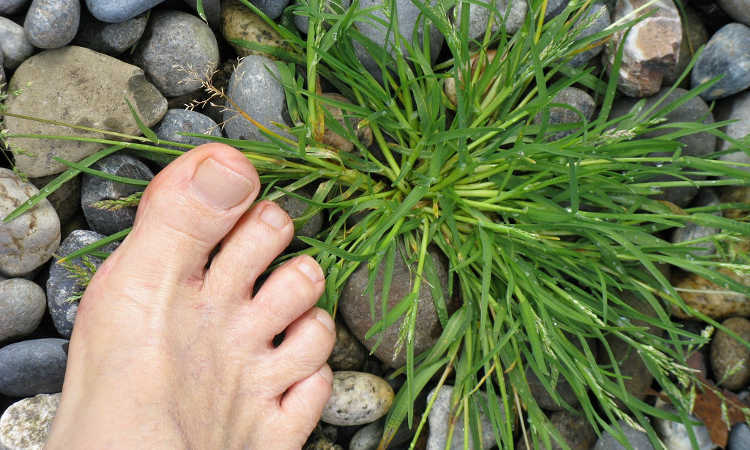 Always wear close-toed shoes to protect your feet from hazards like sticks or biting insects hidden in the leaves. If you have allergies, you may also want a dust mask over your face to protect yourself from allergens and irritating dust. The Ames True Temper has a 20” wide head containing 22 steel tines. This rake has the strength to handle both everyday leaf raking and deep down thatch removal on your lawn. The handle consists of 48” of sustainably harvested North American ash wood with a lacquer finish. A sturdy poly head holds the tines in place, reducing the overall weight of the rake. The total length of this rake is 64”. The size of the Ames True Temper 20” Steel Leaf Rake puts it in the lower end of optimal rake head sizes. I personally like a slightly narrower rake head because it feels lighter in the hands and can fit into corners better than a big-headed rake. One potential problem with this rake is the poly part of the head may weaken, crack, or wear out with time, like any other plastic-headed rake. However, if you enjoy raking with a plastic rake, you may find this the perfect combination of sturdy steel tines and solid poly head. The Gardenite 63” Adjustable Garden Leaf Rake comes with a head that expands from 7” for tight corners all the way to 22” for major raking jobs. The total length of this rake is 63” long. The Gardenite’s handle is 0.75” zinc coated steel for durability and lightness. The 15” tines are rounded and flat, and they don’t flex as much as other rake tines do. 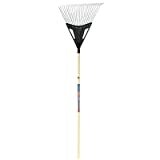 Most people love the lightness of this rake and the adjustable tine feature that lets them get into nooks and crannies. Owners of this rake report they love the ease of the slide adjustment for locking the tines in place. At its smallest, the tine adjustment collapses down into a smaller tool for easier storage. One complaint about this Gardenite rake is the slider is flimsy and may not hold to the proper adjustment. Also, the handle shrinks to 49” with the tines set at 7”, making it more uncomfortable for taller people. Another complaint is the handle has plastic grips with finger indentations, which become uncomfortable to handle during long raking sessions. The JND Telescopic Rake gives you the opportunity to adjust your rake in two ways. First, the steel tines adjust from 7.5” to 21.75” wide, handing you several choices in tine width depending on the job. Also, the JND Telescopic Rake’s handle adjusts from 37” to 68” long, making it easy to store the rake in your garage or on camping trips. The primary material of this rake is steel, including the handle, tines, head, and the heavy duty release and locking switch. This rake also comes with an ergonomic rubberized handle for a better and more comfortable grip. Many owners love the light feel of the rake in their hands as they pick up leaves. They also love the compactness of the rake when it’s completely folded up. One problem users of this rake report is the tines don’t always lock into place well. Also, some users mention the rake tines bend easily when used in heavier duty jobs, but they easily bend back into place. 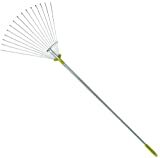 Many people consider the JND Telescopic Rake a light duty rake. 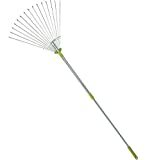 The ML Tools 64” Adjustable Garden Leaf Rake contains a zinc-coated, anti-rust metal handle that expands the rake’s length from 31” to 64” using an adjusting lever on the handle. The 15 flat metal tines shrink to 7.5” wide or can expand to 24” wide. The handle also contains plastic grips. This rake works best with light materials like dry leaves. People who own the ML Tools 64” Adjustable Garden Leaf Rake really love its compact storage capabilities. They also enjoy the ability to adjust the rake head to fit any lawn raking situation. However, some people report issues with the handle’s spin lock mechanism because it can come undone instead of truly locking the handle into the right length. So, Which Is the Best Rake? If you are looking for a sturdy, all-purpose rake that can take on piles of leaves, wet or dry, then the hands down winner is the True Temper 22-Tine Steel Tine Leaf Rake. This rake contains a solid wooden handle that takes the strain of larger loads. The head is metal for long term use, and the parts recycle when you’re finished with it. The True Temper also has plenty of tines positioned close enough together to make it the best rake for grass, pine needles, and small leaves. Finally, the metal head bolts to the wooden handle, guaranteeing that your rake stays together for a long time. Because it has no moving adjustment parts like you see with the Gardenite 63” Adjustable Garden Leaf Rake or the JND Telescopic Rake, the True Temper gives you worry free leaf raking for years to come.